as early as 10 weeks gestation, using a single maternal blood draw. NIPT, also known as cell-free DNA (cfDNA) screening, is a cutting edge aneuploidy screening option. NIPT safely and noninvasively screens for the most common chromosomal aneuploidies as early as 10 weeks gestation, using a single maternal blood draw. How does NIPT differ from traditional serum screening methods? 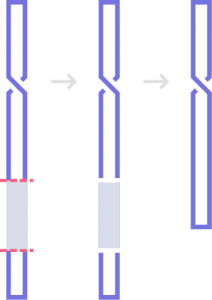 Microdeletions are chromosomal disorders caused by small missing pieces of chromosome material. Some occur more commonly in a specific area of a particular chromosome and have been linked to known genetic syndromes. Most occur by chance, rather than by being inherited from a parent, and can occur with no prior family history and without other risk factors. Why choose non-invasive prenatal testing? The capabilities of NIPT have been expanded to help detect 5 specifcing microdeletion regions. By doing so, the NIPT microdeletion panel can provide valuable information to aid in pregnancy management and prepartion for newborn care. Going to greater lengths for what matters the most. Accurate answers about your baby’s health. cost saving with lowest failure rate.